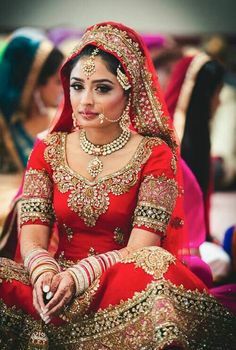 In Indian functions, especially marriages, we have an age long tradition to attend these events in traditional ethnic dresses. And when its about women ethnic dresses, we ladies are lucky enough to have a handful of options by our side. 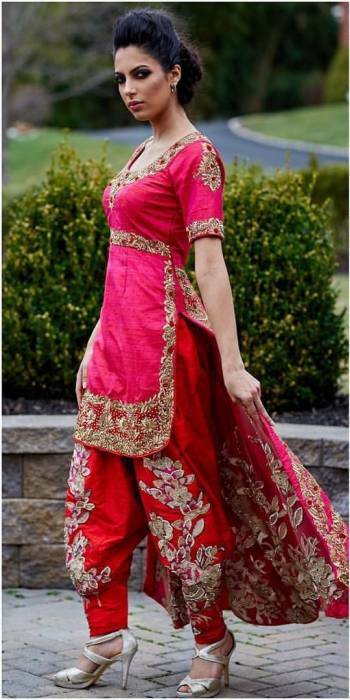 Lehengas work for special occasions, but Punjabi bridal Salwar Kameej suits can be very well carried in every occasion. 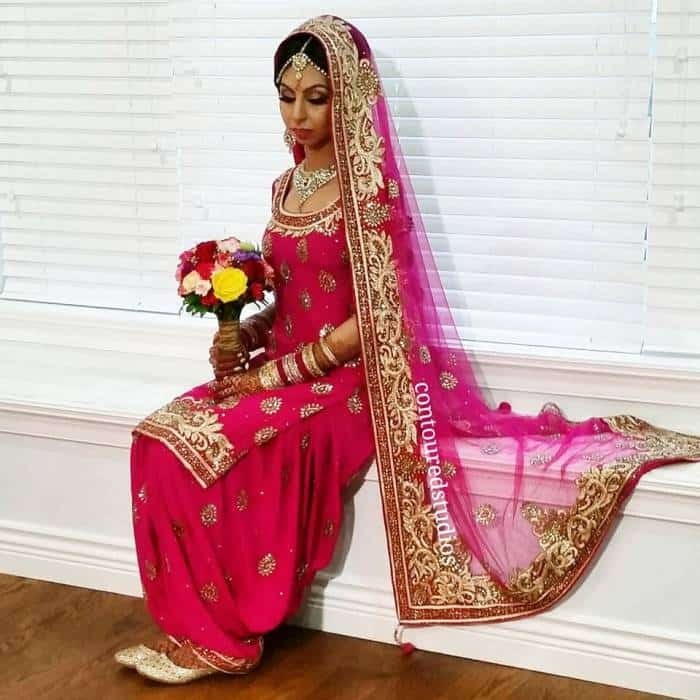 There are various functions like engagement, Mehndi, haldi and other functions post marriage, where one strongly feels the need of beautiful embroidered bridal suits to make an impression. Today we are focussing on the latest designs of Punjabi bridal Salwar Kameej suits. 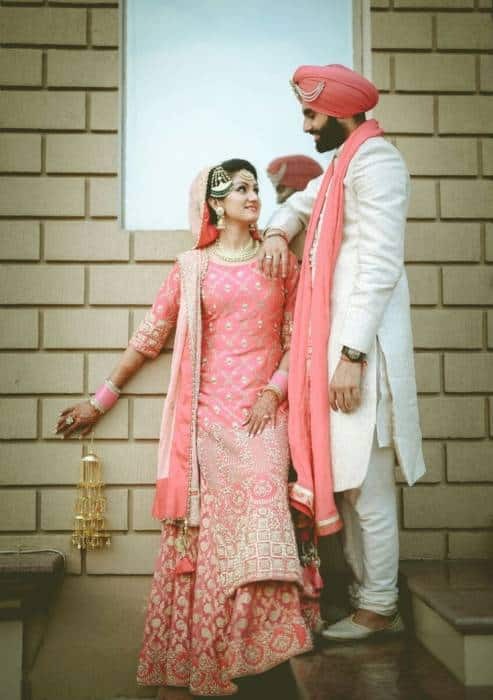 Here we have come up with 30 new ideas of bridal suits which includes Patiala Salwar, Anarkalis and other designer piece hoping that your search ends here. 1: This is a classic piece in velvet fabric which is perfectly crafted into long straight cut Kurta with Churidar and a sheer net dupatta. 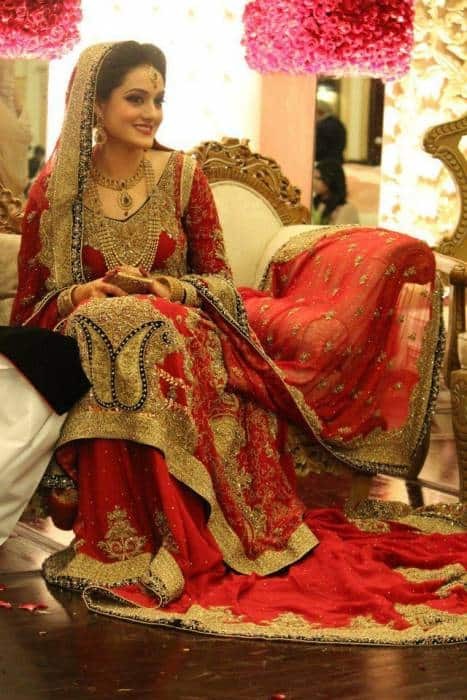 The deep maroon color is the perfect choice for brides and is sure to accentuate their look. 2. These flowy Anarkalis also make a great choice for bridal suits. The best thing about these suits is they are quite comfortable and girls who want to hide their belly fat can look for this option. Girls with good height should surely give it a try. For short and plus size women I would say there are lot other options which truly deserves you. 3. While selecting Anarkali you need to be very careful about its fabric and fitting. An ill fitted Anarkali can completely ruin your look. 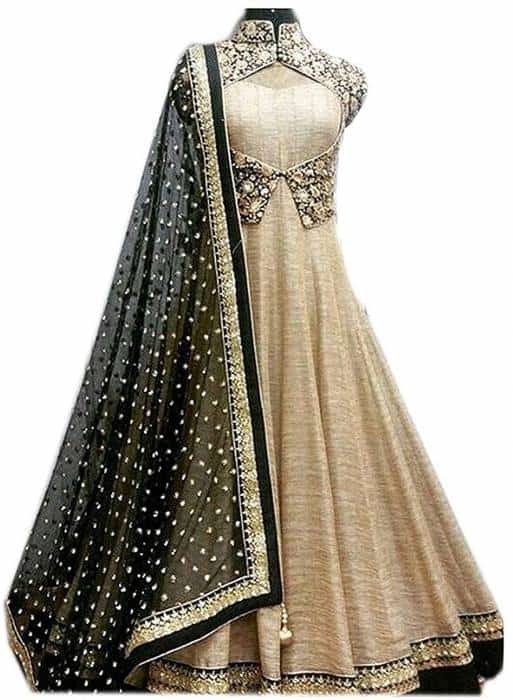 An Anarkali should be properly fitted from the top and its length should be customized according to your height. 4. You can look traditional as well as trendy, both at the same time. Look for slits, cold shoulders or butterfly sleeves to make your ensemble blend of the two. The vibrant colors and rich fabric plays an important part in selecting these suits. 5. 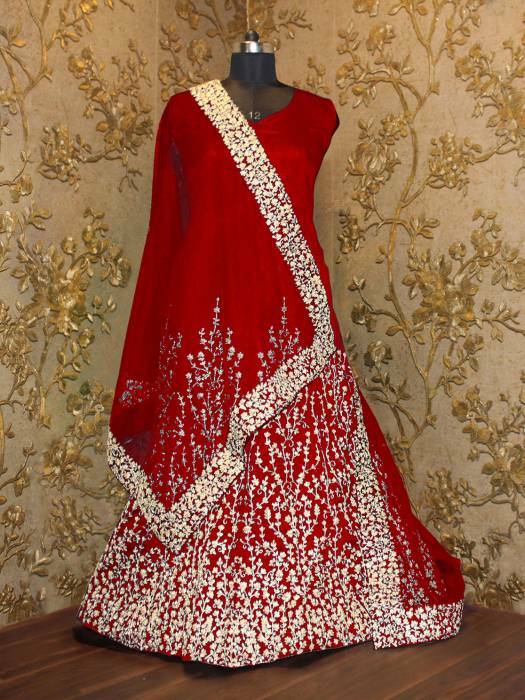 The red designer suit with beautiful embroidery is surely going to be on your wishlist. The effortless beauty of this ensemble compels us to say that less is more. 6. The rich velvet fabric brings lots of elegance with it and that’s the reason in any kind of bridal wear it is being preferred the most. 7. Bore of red, then there are some new colors in the bridal palette. 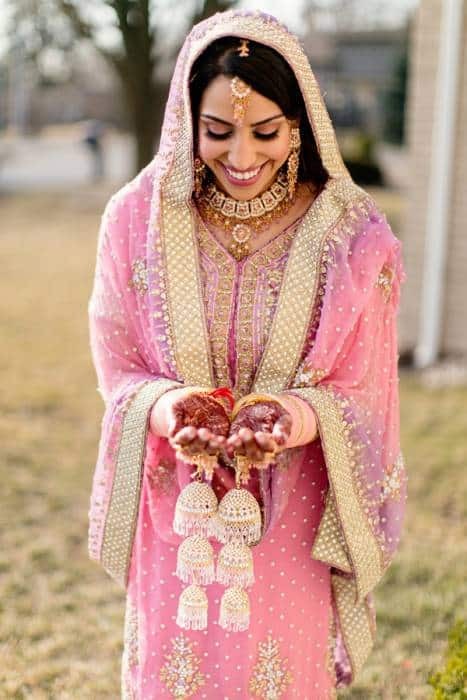 The pastel shades of pink are perfect for day wedding and adds freshness to the whole look. 8. 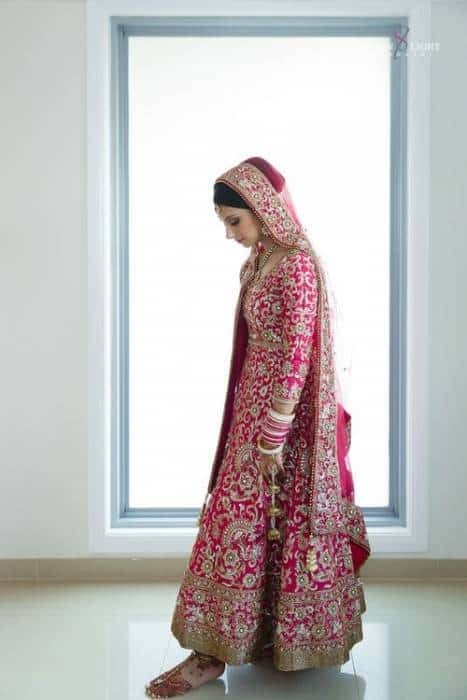 Heavily embroidered suit in dark pink makes a perfect bridal wear. With this ensemble you just need a minimal of jewelry to complete your look. 9. 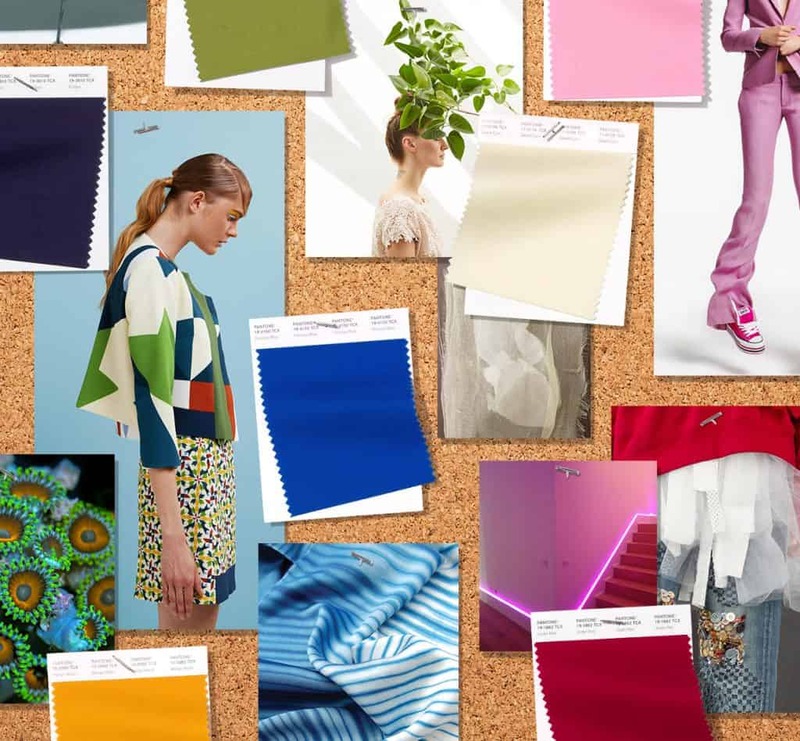 We have also seen colorful combination of red, orange, pink and peach together, which are pretty unusual combinations but make a strong fashion statement. 10. Yellow color is also one of the most loved color by the brides. The amount of radiance that this color gives to one face is unmatchable. This turquoise blue kurta with yellow skirt makes an amazing bridal wear. 11. 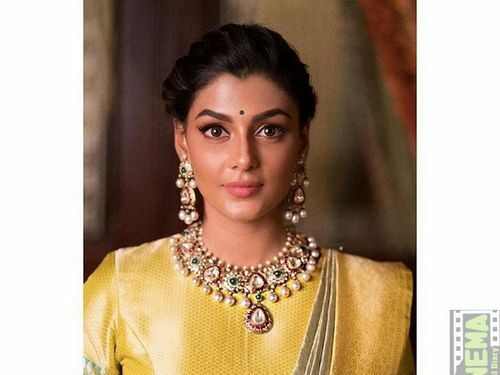 Beautiful color and fine prints can create their own type of magic and you don’t have to always pick heavy embroidered and sequin work outfits to get that newly wed look. 12. 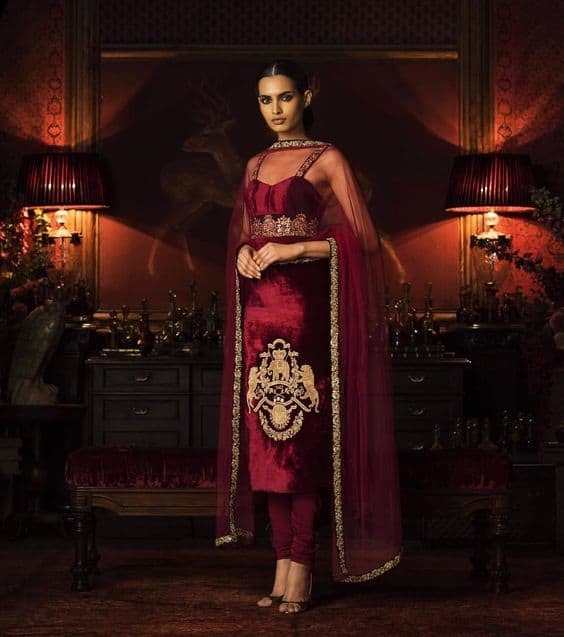 Deep maroon Punjabi bridal Salwar Kameej suits with heavy embroidery and beautifully beaded dupatta. 13. These regal Punjabi bridal Salwar Kameej suits can make you rethink your decision of wearing lehenga on your wedding day. 14. 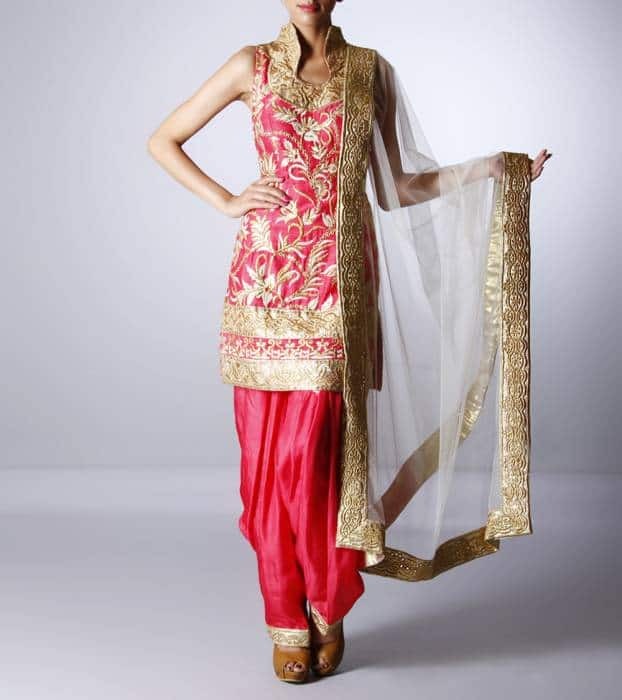 The beauty of this Punjabi Patiala Salwar suit is that it looks fab on every girl. These suits are great for skinny girls to accentuate their figure. 15. The beauty of this peach color is that you can add any amount of sparkling sequins and stones to it; still it gives those soothing effects to the wearer and viewer. 16. 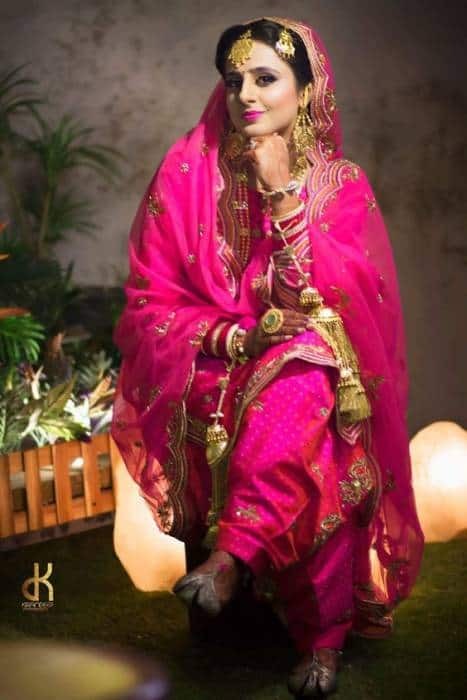 After red, magenta is a very famous color in bridal wear. This dark and vibrant color match with the energy of any function. 17. Plain Salwar suits with beautiful borders in Salwar, dupatta and Kurta can turn into mesmerizing bridal wear. 18. 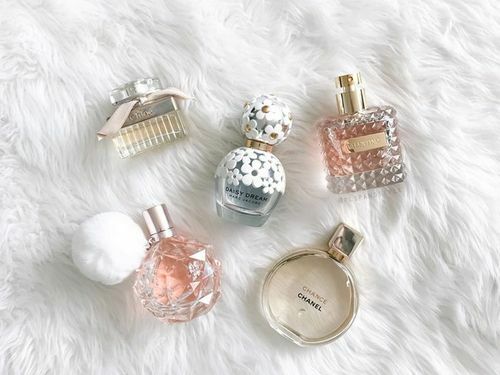 For girls with fairer complexion I would say instead of looking for dark vibrant colors you can pick pastel colors which would work wonders with your complexion and will also give you a fresh look. Dark colors with dark makeup can make you look very dramatic. 19. These pastel colors are best for creating that sophisticated look and great choice for a day wedding. 20. 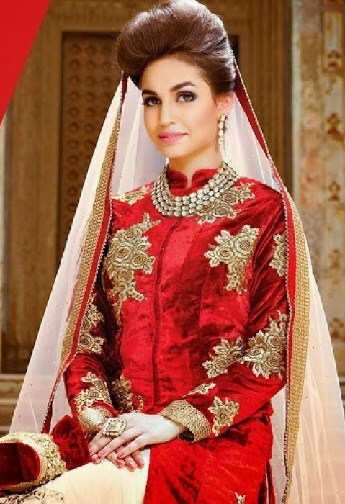 Another beautiful ensemble in velvet with fine and intricate embroidery and great for wedding day. 21. Velvet can be bit heavy and makes well structured dresses so if you want your wedding day dress to be flowy then opt for chiffon and georgette. 22. 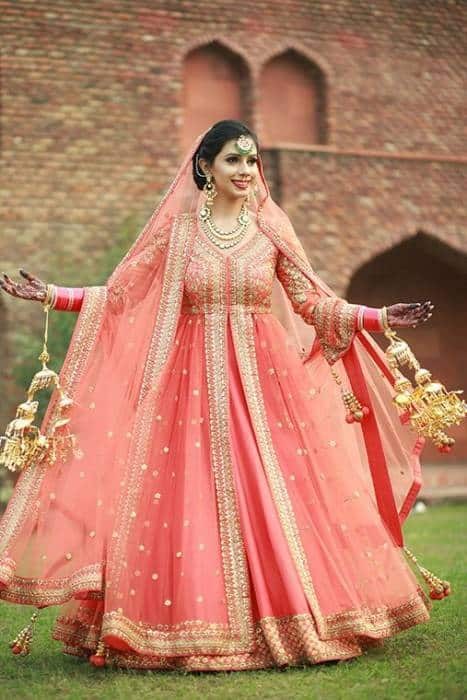 This is a beautiful layered bridal suit in pastel color and it is a great option if you want your dress to be picture perfect. 23. 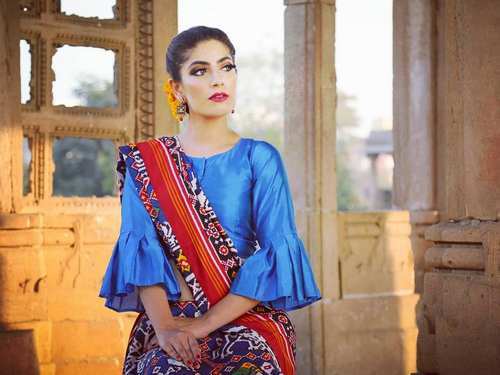 In many communities bridal Salwar suits are preferred over Lehengas and these Punjabi bridal suits are giving tough competition to the other options. 24. Short kurtas with Patiala Salwar is a great option for any bride as one can easily carry this look. 25. This figure flattering suit design with a beautiful mix of two colors from the same family is surely a must have for brides. 26. The traditional red bridal outfit for an effortless bride look. 27. 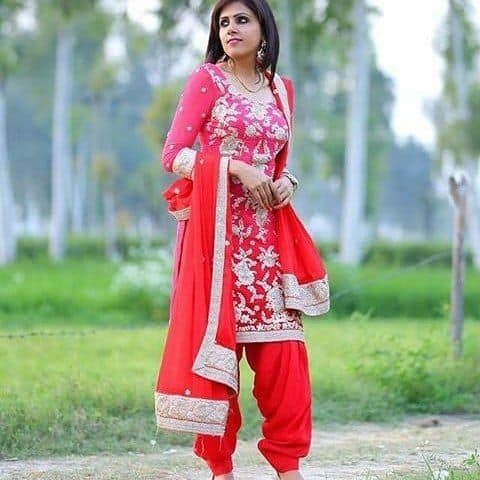 You can also look for red color Salwar suits with beautiful prints which are comfortable and light but not compromising with their look. They make a great wear for post marriage functions like Pooja ceremony etc. 28. This designer piece is a must have if you are looking for a dress which would turn everyone’s head towards you. 29. Rajasthani prints are known for their beauty and are loved worldwide. You can also enhance your beauty with these traditional prints. 30. Phulkari work from Punjab is also very much popular for its colorful look. You can try beautiful phulkari work dupatta, phulkari work Patiala or a kurta with this beautiful embroidery to glam up your look. 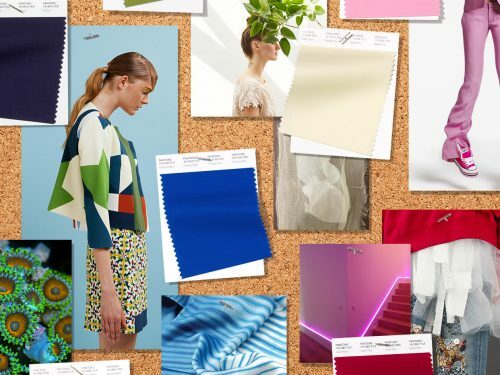 These awe-inspiring suits designs are sure to inspire you. The above Punjabi bridal salwar suits will give you a whole lot idea about variety and color that you can pick for yourself. Chetna Joshi, You Posted Awesome stuff on Best Panjabi Bridal Dress And its run with Latest Design. All are nice designer wear. 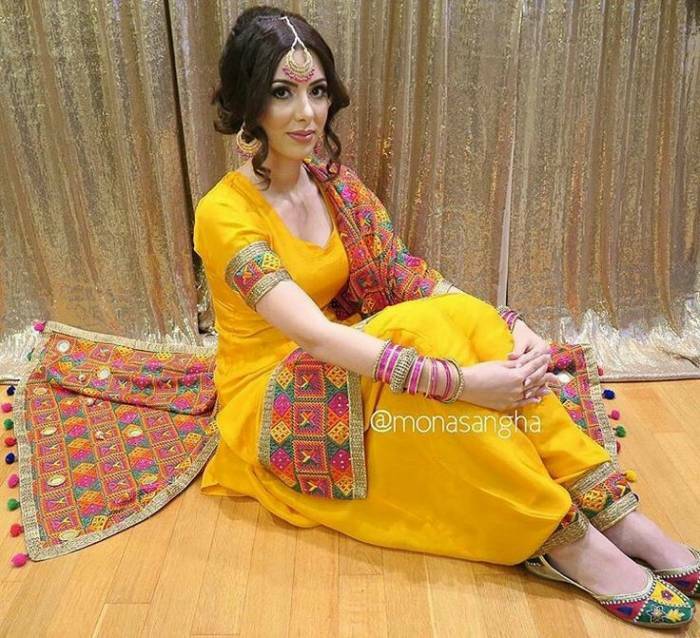 Really nice collection of punjabi suits, i like indian ethnic wear very much. Your collection of Indian Anarkali was awesome and mind-blowing. wow, nice all salwar kameez designs. thanks for sharing his shopping options give. Thanks. Will soon be coming with shopping options.